Almost every front page of Iran's daily newpapers covered the nuclear deal on Wednesday 15 July. Screenshot from www.jaaar.com. Iran's media landscape is typically a place to gauge what differences lie across the country's political factions. However, on Wednesday, July 15, the country's various publications seemed to be on the same page, so to speak, as the news of the previous day's historic nuclear deal dominated almost every cover. Across many different types of factions, it seemed that news of the agreement between Iran and the P5+1 countries (the United States, United Kingdom, Germany, France, Russia, and China) was welcomed. The deal is expected to pave the way for economic progress in Iran as it means lifting international sanctions in exchange for the country limiting its nuclear program. The boldest statement came from Etemaad, a reformist publication that claimed “The World Has Changed” as its headline-grabbing statement. It described the Persian date of 23 Tir 1394 (July 14, 2015) as the day of a “diplomatic revolution”. The editor-in-chief of Etemaad (which means trust in Persian) is Elias Hazrati, a well-known reformist figure close to Mehdi Karroubi, one of the leaders of the 2009 Green Movement still under house arrest. 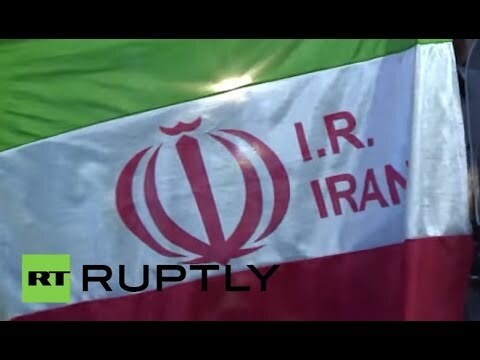 Indeed, reformist sentiments and allusions to the 2009 Green Movement dominated many of the celebrations in the streets Tuesday night in response to the news of the agreement. Dancing and jubilant honking were followed by chants to release Mehdi Karroubi and Mir Hossein Mousavi, the still detained opposition leaders and presidential candidates from 2009. The majority of Iranian newspapers didn't mention such celebrations on their front pages, but focused on the news from a policy standpoint. 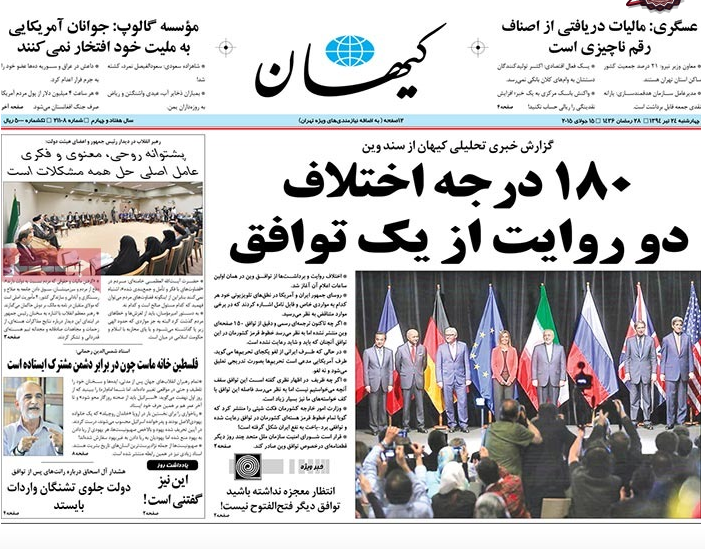 The well-known hardline newspaper Kayhan even came out with neutral coverage of the agreement. Over the past few months, the newspaper has been extremely critical of the negotiating team and the concessions offered to Western countries in efforts to reach the deal. Many often see Kayhan as an informal mouthpiece for the office of the Supreme Leader and hardline conservative sentiment within Iran. The editor-in-chief of the newspaper, Hossein Shariatmadari, is directly appointed by Khamenei. Shariatmadari is associated with Iran’s intelligence services and is a former Revolutionary Guard official. Kayhan is also recognized as a security organization in charge of building cases against the opposition and those critical of the regime inside the country and abroad. 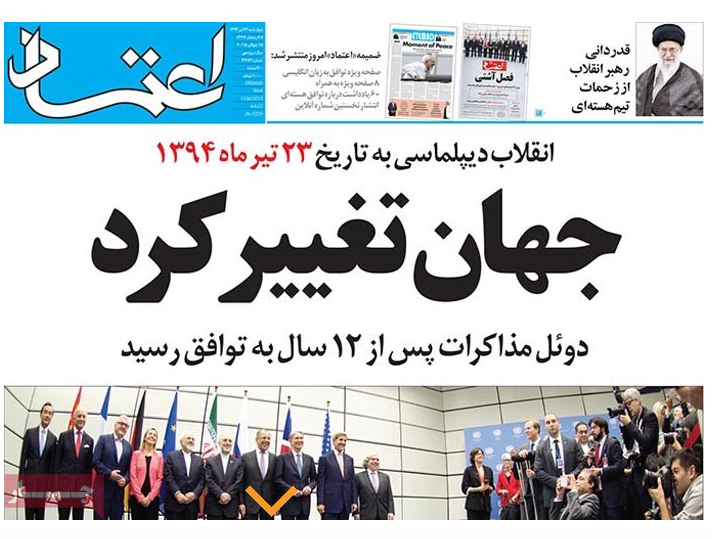 The Tuesday cover of Kayhan asked with explanation marks if this was the final phase of the negotiations after a 12 years, in contrast to its typical biting criticisms of the negotiating team, and process. It should be noted that the 12-year period that Kayhan refers to is the one starting with the beginning of the Ahmadinejad presidency, when Iran began to engage the international community over its nuclear program. In 2006, the UN Security Council finalized these discussions by imposing sanctions after Iran refused to suspend its uranium enrichment program. The front page of Tehran's newspaper's on Tuesday 23 Tir, that anticipate and support the finalization of the nuclear agreement. Following the completion of the deal, their Wednesday cover ran with this headline: “180 degrees of differences from two stories in one deal,” recognizing the achievement in the historic deal amongst traditional foes. Kayhan's front page from Wednesday, July 15 exclaimed “180 degrees of difference from two stories leads to one deal”. Other newspapers took a more nationalist stance towards the results of the negotiations. Ebtekar is a reformist newspaper that has experienced some turbulence since the beginning of President Hassan Rouhani's administration with a few forced closures in April 2014. It ran an attention-grabbing headline comparing the Javad Zarif, the foreign minister at the helm of the negotiations, with Iran's famous nationalist Prime Minister Mohammad Mossadegh. Mossadegh was famous for nationalizing Iran's oil industry in 1951 out of the hands of the British government. 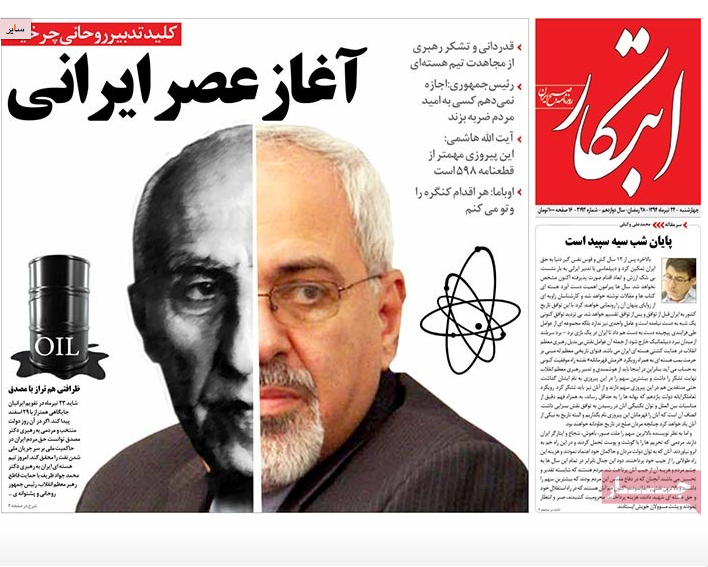 Ebtekar's front page likens what former Prime Minister Mohammad Mossadegh did to nationalize Iran's oil industry, with what Foreign Minister Javad Zarif has done for Iran's nuclear program.